2018 Macbook Air 13"2017/2015 Macbook Air 13"2018 Macbook Pro 13"2017 Macbook Pro 13"2016 Macbook Pro 132015 Macbook Pro 13"2018 Macbook Pro 15"2017 Macbook Pro 15"2016 Macbook Pro 15"2015 Macbook Pro 15"New Macbook 12"Macbook Air 11"
2018 Macbook Air 13"2018 Macbook Air 13"
2017/2015 Macbook Air 13"2017/2015 Macbook Air 13"
2018 Macbook Pro 13"2018 Macbook Pro 13"
2017 Macbook Pro 13"2017 Macbook Pro 13"
2015 Macbook Pro 13"2015 Macbook Pro 13"
2018 Macbook Pro 15"2018 Macbook Pro 15"
2017 Macbook Pro 15"2017 Macbook Pro 15"
2016 Macbook Pro 15"2016 Macbook Pro 15"
2015 Macbook Pro 15"2015 Macbook Pro 15"
New Macbook 12"New Macbook 12"
Macbook Air 11"Macbook Air 11"
This stylish simple design laptop sleeve is specifically designed for the MacBook laptops. 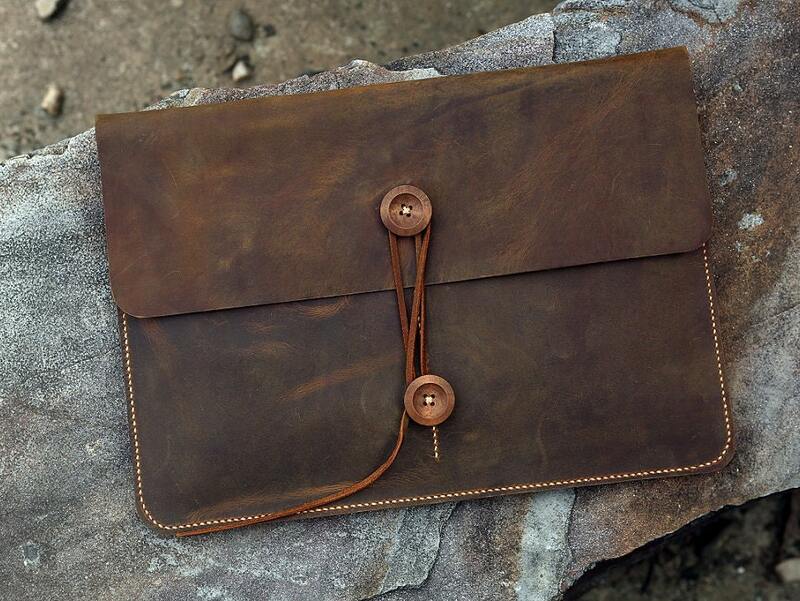 This sleeve offers a snug fit so your laptop stays secure and the natural look of the leather offers a classic, professional style that is sure to impress. I just received my MacBook Pro leather cover and I LOVE it! It’s very well made, the leather quality is awesome and it fits my computer perfect. I will say it was well worth the wait, however long it actually took (~15days). I would recommend this to any of my friends and family. This is exactly what I wanted. So happy. From the beginning of my inquiry regarding the item, the staff from this shop has been very helpful and courteous. I wanted to make sure that I am getting the item with exact size and the color that I see on the web site. Exactly 6 days after I sent the payment, I received the sleeve (very fast turn around from China to NYC). And I am very happy with the quality of the item. It is beautiful to look at, feel and even smell nice (genuine leather). 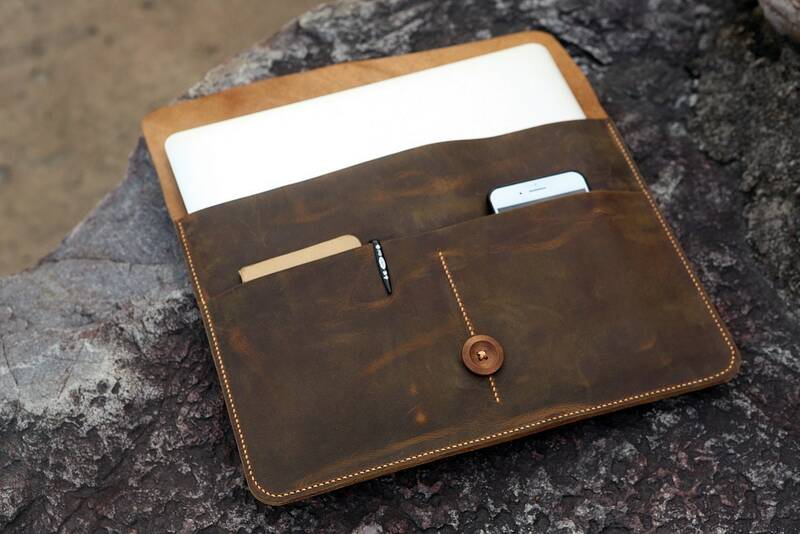 I am sure that this sleeve will outlive my laptop and many more years.. Funny thing is that I feel like I actually went to the store, talk to a nice sales person and got out there with a well crafted piece of art object. That's how smooth and pleasant the transaction was for me.